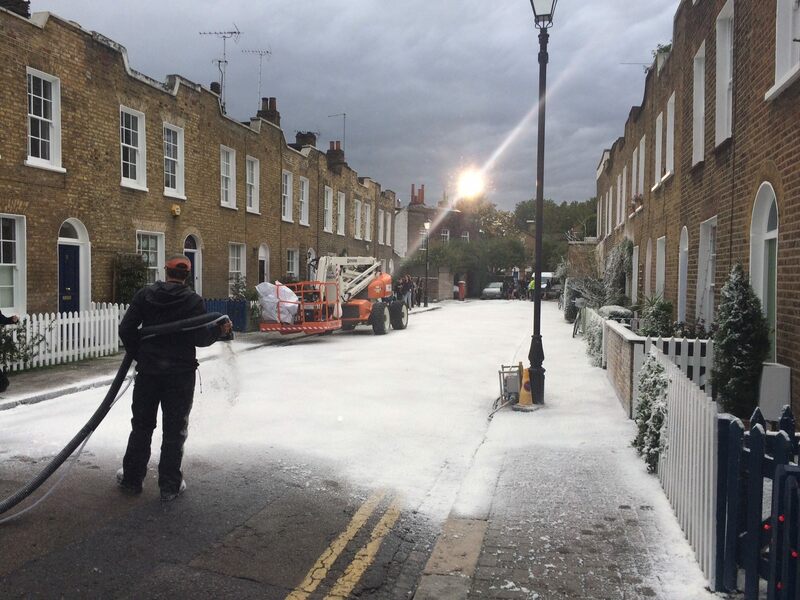 The snow FX is settling, as the latest Christmas ad we helped hits the small screen today. Take a look here at Quality Street’s new commercial, The First Sign of Christmas. The chocolate brand chose Clarence Way in Camden as its idyllic street, in which a father and daughter notice chocolate wrappers floating from the sky, and turning to festive snow. Their neighbours gather while the swirl continues, to The Clog Dance from the ballet, La Fille Mal Gardée. Then, all’s warm and cosy inside, as children tuck into a tub of chocs. We worked closely with the production, requesting extra team members be on hand to tidy up the wrappers – although most of them you see are CGI. The Harvey’s ad uses Kingston homes, in Surbiton’s Pine Walk, to show neighbours watching enviously as a family orders all the furniture they need to play hosts at Christmas. Take a look here and here. A donation to locals of £1,000 will be spent on a local school for disabled children and a street party next year. Waitrose used a home near Streatham Common in Lambeth and another in Merton’s Arthur Road for its Christmas ad, making donations to Friends of Streatham Common and Wimbledon Park. Take a look here. In Asda’s Christmas ad features a dog on a frosty patch of ground in Lewisham’s Blackheath. That production made a generous donation to Blackheath Common. The Sainsbury’s ad used the interior of a home on Knatchbull Road in Lambeth and then filmed the party at Leighton Place in Camden. Take a look here. And the DFS ad used a home on Wray Crescent in Islington for its shots of comfy sofas in the Christmas ad. You can see it here.